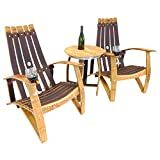 If you consider yourself a connoisseur of fine wines and are in need of some unique rustic furniture for your wine cellar or patio overlooking your vineyard, then check out these cool new Wine Barrel Chairs and Table from Kiwi Woodkraft. These unique chairs are handcrafted from reclaimed oak wine barrels with the seat and backrest made from barrel staves. The chairs come in either a rocker or a stationary design in a set of one or two along with a matching barrel table.